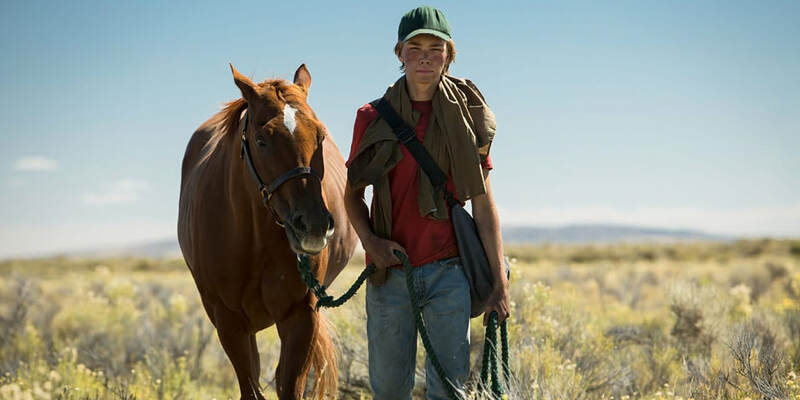 THE STORY - Charley, a teen living with his single father, finds work caring for an aging racehorse named Lean On Pete. When he learns Pete is bound for slaughter, the two embark on an odyssey across the new American frontier in search of a place to call home. THE GOOD - A touching and meditative road movie. Shows us a part of America rarely seen in cinema. Performances are all serviceable. THE BAD - Lacking enough momentum and energy to push it over the finish line and thus make it truly special. ​​​​​Are we running away or towards something? In "Lean On Pete, the character of Charley is seen running in multiple scenes and while on one hand, we know that his ultimate goal is to make it to his beloved Aunt in Wyoming, on the other hand, we know that he is running away from the life that he has found himself in. "Lean On Pete" is a meditative and transformational journey through a part of America we rarely see in contemporary American cinema. Accompanied by the horse he loves, this purely American story is filled with touching moments but like its many supporting characters who only show up for brief scenes and disappear without much impact, writer/director Andrew Haigh's ("Weekend" and "45 Years") new film is languid and fleeting. Charley Thompson (Charlie Plummer) is a 16-year-old kid from Portland Oregon who has grown up poor and with a single delinquent father (Travis Fimmel). One day, while running down the road, he has a chance encounter with Del (Steve Buscemi), a horse trainer with a temper who gives Charley his first job as a helping hand with the horses. Charley grows quite fond of a horse named Lean On Pete. However, the horses are not meant to be pets and when Lean On Pete fails to win any races for Del, Charley knows that Del will have the poor horse sent to Mexico to be executed. Afraid of losing the one good thing in his life, Charley takes Del's truck and Lean On Pete across the American landscape to Wyoming where his Aunt Margy, who he has not seen in nearly ten years, is hopefully still residing and can take both of them in. "Lean On Pete" is anchored by the young and promising new actor Charlie Plummer ("All The Money In The World"). While there's no doubting that this young kid certainly has talent, it's reduced to its most simplistic attributes in "Lean On Pete." Equal parts captivating and monotonous, Plummer is never able to give the movie the spark it needs to truly stand out and become something special despite the story's intentions. The film relies on a multitude of supporting roles from Travis Fimmel as Charley's poor and carefree father Ray, to a homeless man that Charley meets played by Steve Zahn, to Steve Buscemi as the vulgar and ruthless horse trainer named Del and his jockey, Bonnie, played by Chloë Sevigny. All show up, serve the story and then quietly exit before they can delve into the meat of their characters and add more substance to the story. Andrew Haigh's film is divided into two halves. The first half is about establishing who Charley is, what his relationship with his father is like, his life at home, how he meets Del and ultimately the horse named Lean On Pete or Pete for short. The second half follows Charley and Pete on their journey across the streets, towns, and deserts of America from Oregon to Wyoming. The journey is often times beautiful as Charley and Pete travel across some breathtaking landscapes and also tense, as you wonder if Charley will get caught or stopped from making his way to his aunt. No matter which way you look at it, "Lean On Pete" is at war with itself: Is it running towards greatness or away from it? It seems to be doing both equally at times and this is highlighted by the film's final shot which shows Charley running down a street. With the camera facing his back and the world around him out of focus, he suddenly stops. He looks around, almost fully turns around to face the audience but does not. Tired yet relieved, the film ends and so too does my wonderment over whether what I just saw was truly great or merely adequate. Now that I've reached the finish line, I still don't truly know.